These mid-August days in the 70’s have felt quite refreshing to southern Minnesotans as we return to outdoor activities in comfortable temperatures. Humidity levels however are still rather high, and over the weekend St. Peter received another inch of rain via a couple thunderstorms. According to the next ten days’ forecast, we’re in for another hot “bump” this weekend and into early next week as temperatures will once again (shrug) approach ninety degrees Fahrenheit, but by mid-week we should be back to highs in the 70’s and lows in the 50’s. In my previous posts regarding the butterflies that have been ever so prevalent in the Linnaeus Arboretum’s gardens for several weeks, I have neglected to mention some of the other non-birds or non-butterflies that are frequenting the flowers. Perhaps even more numerous right now than the butterflies are Great Black Wasps, which look like giant menacing hornets with black bodies and blue-tinted wings. Fear not, for these are mostly gentle giants more intent on nectaring and collecting pollen than stinging the wary human. Bumblebees are also quite common among the gardens, and are perhaps even more gentle than the wasps; so gentle, in fact, that one can actually stroke the bees’ backs as they look for nectar if he or she feels so inclined. Aside from stinging insects, moths are also likely to be encountered nectaring on the various flowers; most of these are small and brownish and therefore much less flashy than their butterfly cousins (and many of these species are difficult to identify). There is one moth however that stands out rather noticeably, and the only thing with which it might be confused is a hummingbird! 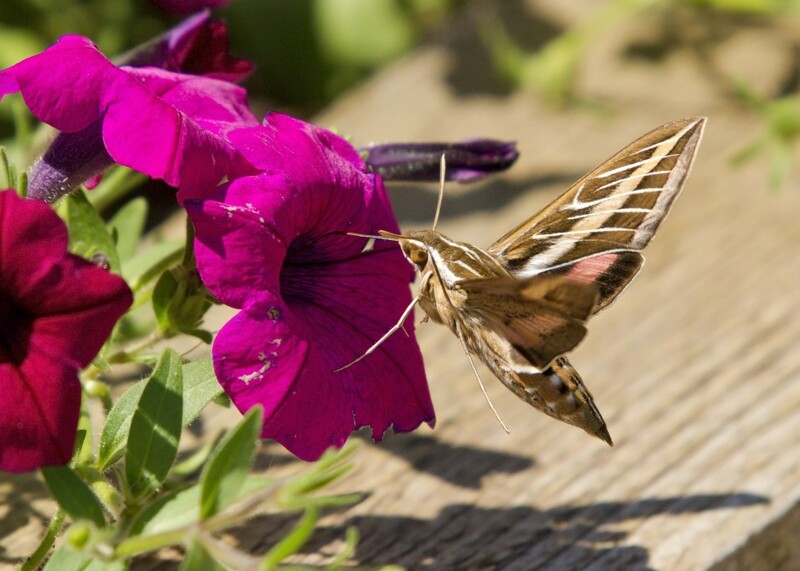 I’m talking of course about the White-lined Sphinx moth, also known by other such names as Hummingbird Moth or Hawk Moth, that looks very similar to a hummingbird in both appearance and behavior. Mid-August through mid-September tends to be a good time to find these large moths in your gardens; look for them especially in the early morning or evening hours. White-lined Sphinx nectaring on petunias in annual garden in front of Interpretive Center, 8/17/10. Loverly. Thanks for the knowledge and pictures, Bob! Keep it up.